Our smallest home, but don't let it's size fool you this house has a living and dining area, compact kitchen and bathroom, plenty of storage space and a sleeping loft. 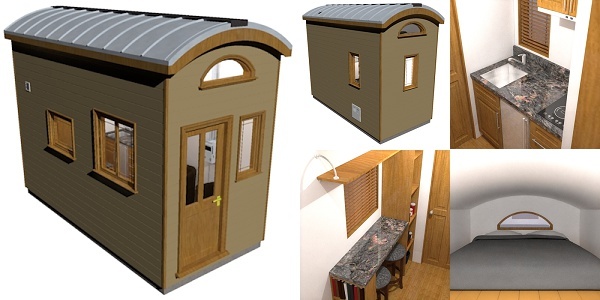 Our smallest home (based on living area square footage!) packs a punch. It has a cosy living area surrounded by windows and has a fully vaulted ceiling to enhance the feeling of space. As usual we’ve made provisions for armchairs and the gas fire heater. Storage space has been accounted for with its floor-to-ceiling shelving/closet unit and an additional under-counter shelf unit. This home features our most compact kitchen, with one side dedicated to your fixtures and fittings: sink, refrigerator, and cook-top. While the other wall contains a dining/worktop area, with a shelf over the window and another floor-to-ceiling shelving/pantry unit. On top of that it has additional storage in the form of base and wall cabinets and drawers! The bathroom has space for all your necessities – shower, toilet, and a built-in storage cabinet. And if you just can’t live without it, an optional sink can be installed in the bathroom. The loft can accommodate queen sized mattresses, and is lit by two large circle-segment windows, but perhaps the coolest feature of this home is the curved ceiling, which increases your vertical/horizontal space in the loft!